June 18, 2018, 12:01 p.m. Foundations across the U.S. are helping journalists watchdog the powerful — but who’s watching the foundations? A study co-published by the Shorenstein Center and Northeastern University (and funded by a couple of foundations itself) zooms in on the role played by foundations in the journalism world. 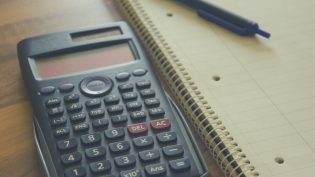 Researchers Matthew Nisbet, John Wihbey, Silje Kristiansen, and Aleszu Bajak analyzed more than 30,000 grants (totaling $1.8 billion) from more than 6,500 foundations between 2010 and 2015. — Thirty-two percent of the $1.8 billion went to industry-supporting initiatives rather than direct journalism — university programs, professional development groups, and research and technology development. Public media received 44 percent of the $1.8 billion, but it wasn’t evenly distributed across the country/stations. 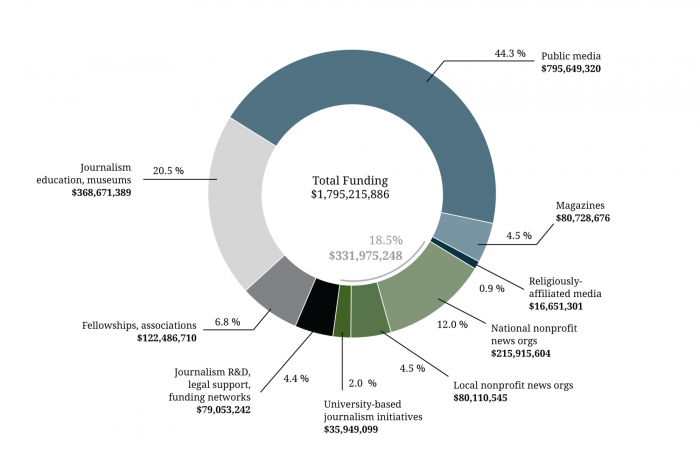 And national news nonprofits got 12 percent (“the leading two dozen recipients were also notable for featuring six deep-vertical news organizations that specialize in coverage of topics like the environment, and six nonprofits that have a clear ideological perspective”), while local/state news nonprofits received 5 percent of the total pool. — Some of the 30 interviewees (including thought leaders, stakeholders, and nonprofit experts) expressed frustration with a “pack philanthropy” culture. The leading nonprofits like the Texas Tribune or ProPublica, they say, are able to attract a lot of foundation dollars in a competitive funding environment. They serve as an example for how others can do it, but they can also soak up some of the funding opportunities, and foundations can be risk-averse about funding early-stage ideas. — Magazines like Harper’s, Education Week, and Mother Jones received 62 percent of all foundation money given to magazines ($80.7 million total). The funding was split between a third for Harper’s, a third for left- or right-leaning magazines, and the last third for education or other issue-based magazines. You can read the full report, with its detailed analysis and more meaty charts, here. Schmidt, Christine. "A look at how foundations are helping the journalism industry stand up straight." Nieman Journalism Lab. Nieman Foundation for Journalism at Harvard, 18 Jun. 2018. Web. 25 Apr. 2019. Schmidt, Christine. "A look at how foundations are helping the journalism industry stand up straight." Nieman Journalism Lab. Last modified June 18, 2018. Accessed April 25, 2019. https://www.niemanlab.org/2018/06/a-look-at-how-foundations-are-helping-the-journalism-industry-stand-up-straight/.